This is the only shot I have of the bean dish we have been having night after night the last two weeks. We are coming to the end of them now, they were so pretty when they were in flower and we got loads of them this year. We’ve put some more in the ground and are crossing our green fingers that they will give us a late crop in a couple of months time. I was given a copy of Hugh Fearnley Whittingstall’s River Cottage Everyday as a present by my lovely friend Mandy, and on my first gallop through it, I came to a halt when I saw this bean dish. Because I am too lazy to go downstairs and drag the book back up here I will give you the general gist of it. Because that is what it is, a general gist of a recipe, more a technique than anything, which you can vary as you please with what you like. Before cooking they look like this! Catch your beans, or your carrots, or whatever, cook them lightly with steam so they are cooked but not floppy. If you like garlic, splat and finely chop a clove or two. 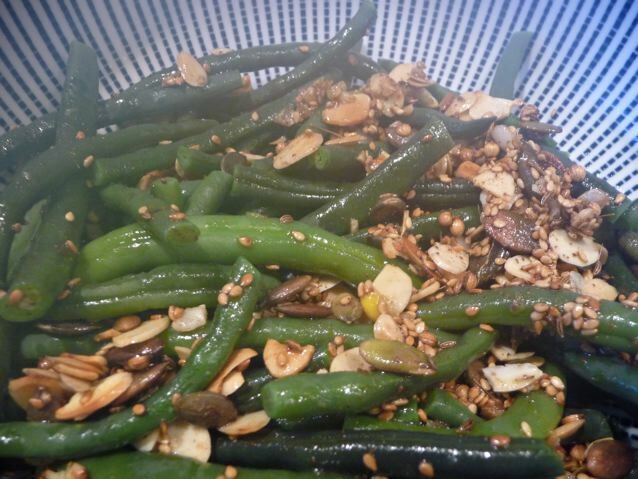 While the beans are cooking, put a mixture of your favourite seeds and spices in a dry frying pan, throw in some flaked almonds maybe, some pumpkin seeds, coriander, fennel, a pinch of chili, sesame seeds if you are Brian. Get those seeds and little packets out of the cupboard. (Oh yes, I heard you Michael McIntyre! Goulash next week….) Heat them up till the almonds start to colour and go brown and the seeds begin to pop a little. Turn the heat off and then add a Keith Floyd sort of splosh of olive or walnut oil, and the chopped garlic. Give it all a good shuffle in the pan. Don’t turn the heat on again; there will be enough heat in the pan to lightly cook the garlic. Drain the beans, carrots, whatever veg you are using. Put in a serving bowl, sprinkle with flaky Maldon sea salt, black pepper, and tip the sizzling, toasty, and aromatically charged seedy loveliness all over the beans. So good! Serve with couscous or rice or whatever else is on your table. I suspect that kids won’t eat this with their aversion to bits, but that means all the more for you! Now I want some more all over again! Normal bread service will be resumed soon. This entry was posted in Garden, Vegetables and tagged beans, herbs and spices, Michael MacIntyre, River Cottage, toasted seeds and nuts on 09/08/2010 by Joanna. I am sure you used to do something similar with seeds for salads? Glad to hear the all purpose macaroons are doing well ! If you’ve eaten them every night for two weeks, then they must be magnificent! I love how they change colour on cooking. I find most of HFW’s recipes to be general rather than specific – one of the reasons I love them, they’re so adaptable! They are the best beans Celia. small, tender, sweet and don’t need stringing just topandtailing. I think if you add something to the water like bicarb? the colour doesn’t change, but I haven’t tried it yet. Not sure I want to anyway. I like the recipe- it can fit to any veg or fancy. Your beans are lovely, and how smart of you to have a second crop going. This is the first year I don’t have a veg garden of my own. I moon over all the produce at the Farmer’s market- and I’ve been buying entirely too many ears of sweet corn. But no one is complaining- the corn is always the queen at the summer table. Heidiannie, what do you do with all the corn and how do you get the kernels off without them flying all over the kitchen? We eat them on the cob too but it’s nice to be able to use them loose as well. I use a very sharp knife and a very deep bowl to cut it off the cob. And then it is wonderful in Southwestern salads with jalapeno peppers and black beans, in salsas, and in chowders of all sorts, in spoonbreads, also, just frozen for use later in the year! My friend’s Japanese in-laws are spending the summer here, and they are bemused by our American gnashing of teeth on the cobs. They pull the kernels off one at a time- which can make for a very long meal. It certainly does highlight the flavor of the corn, however, and after experiencing it that way, eating it in great mouthfuls does seem excessive. I’m thinking of planting a bed of spinach for the fall- but it is extremely hot right now and humid. The seeds would probably love it- but I’m not venturing out, yet. So you kind of disappear the cob into the bowl.. Makes sense… I had Japanese girl lodgers once upon a time. I used to cook for them each night. It was a learning experience. They were very enthusiastic and good eaters! I don’t remember serving corn though :). So one last question, Heidi, do you cook it before it goes in the salads, or does it go in straight from the cob ? I cook it- but really just parboil. 2 to 3 minutes in boiling water, then let it cool until you can hold it in your hand. After cutting off the kernels, I change bowls and scrape down the sides of the cob with a knife. There is a lot of corn left, and my husband loves creamed corn. The scrapings are very sweet and make a perfect addition to creamed corn- you don’t have to add hardly anything else when you combine the last bits you’ve scraped off to a couple of ears of large kernels. A couple of TBS. of cream a pinch of salt and voila- creamed corn. Ha ha! Clever you! I found them here in the UK too and does it work £7.99 well? Dan, give it a try – I really like fennel seeds for some reason but Brian prefers the crunch of the coriander seeds. Five spice …. ha ha ha ! love it! Away from salt & pepper and backwards to veg, I’m jealous you’ve got your pots already – my haulms are still full on green and standing tall in their (bottom split) cement bucket! Patience as they say …. I’m very much looking forward to tasting my first home-grown spuds, as I’m sure you were. How were they? Will we see your first dish with these soon? My pot-grown toms are a real surprise and have survived my inexperience and blight (o joy :)) and I’ve already had a few of them … not bad for f1 hybrids. The salads are brilliant too and doubly so because they are growing in the spaces among the burgeoning asparagus; I’m thrilled at this double usage of the growing space, even more so because they’re planted at the back of a tall border with a 4 metre high hedge behind them – so a huge and welcome surprise that this space could be productive at all. On an impulse (everything edible in my garden this year was an impulse – but good ones!) I also planted, here and there, some mangetout pea seeds …. utterly wonderful to go wandering along the border and nibble as I pottered (a favourite activity :)) so this autumn I intend to prepare planting areas for both these and your lovely purple dwarf beans …. already been sussing out the seed catalogues today (‘purple queen’ here I come ….. :)). The comment column is shrinking oh dear! Something has gone a bit awry. Your garden sounds full of delights right now Blue. How wonderful. I want asparagus but our garden is too small I think. Joy Larkcom advocates planting single crowns in a mixed border if there is insufficient space for a dedicated trench – I’m guessing a crown would not need more than 1 ft sq. of dedicated unobstructed root space but I’m sure Brian knows more about this than I do . My Hessayon veg book also wrote that there were a lot of myths about asparagus spacing etc., so why not give it a try? Don’t you need sandy soil too, or something…. how does asparagus feel about heavy wet clay soil? What do the books say? Brian’s Dad used to grow asparagus when he had the market garden, and sell the flowers, no one ever ate it! I don’t know if we have any spare root space anymore. It’s pretty packed out in our little back garden…. Got to love a salad dish that can be eaten in abundance and daily. The Monkeys would wrinkle their noses, but their loss I say! I might make this one this weekend, it wont have the love and taste from your garden ones, but I’ll give it a crack. I used to dress and dance just like that, Joanna! 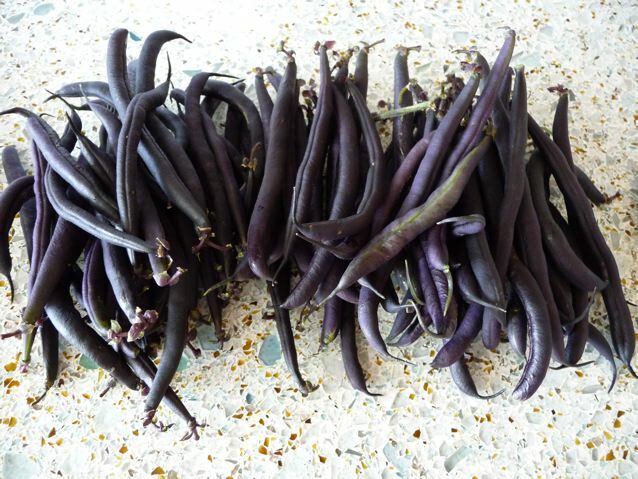 I’ve tasted those beans and they are delicious, and Joanna’s garden really is a lovely growing treat to walk around. & I’ve got the HFW book too. I have those beans in my garden! I’ve been eating nothing but beans for 3 weeks – and no eand in sight. I’ll try this next. Good thing I love beans! Hi, just got here by a google, I just harvested quite a good handful of Purple Queen, and was wondering how (especially how long) to cook.. Your “bits from the cupboard” looks nice, especially as we lso picked some corrianda today too! Mmmm I almost wish it was dinner time now!!! I hope theres a Pizza in the fridge for the boy!! Hi nice to meet you Mark! For al dente beans, steam for about seven minutes maybe? Sometimes we just boil them quickly, just as good, for softer beans a little longer.. Mine are all eaten now, I have some little plants coming up again but I don’t know if they will flower and fruit….